NOTE: Media interested in viewing the public session or interviewing the NOAA speaker must RSVP to listen.sessions@noaa.gov by 4 p.m. CDT on Sunday, Nov. 25. 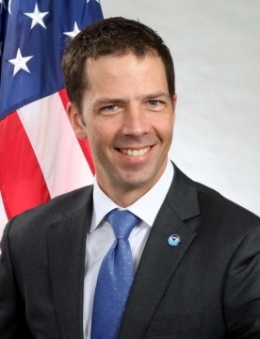 Neil Jacobs, assistant secretary of commerce for environmental observation and prediction at the National Oceanic and Atmospheric Administration (NOAA), will be in Madison on Monday, Nov. 26, to gather public input on the Department of Commerce’s 2018-2022 strategic plan and the Weather Research and Forecasting and Innovation Act of 2017. The listening session will be held at Union South Varsity Hall from 2:30 p.m. until 4 p.m. Jacobs plans to discuss NOAA’s efforts to improve the translation of weather research to operations, to develop a community-based weather model, and to advance seasonal-to-subseasonal weather forecasts. His remarks will be followed by a period for public comments. This is an opportunity to ask questions and provide input on these and other NOAA and Department of Commerce priorities. One goal of the strategic plan is to strengthen U.S. economic and national security by reducing the effects of extreme weather through implementation of the Weather Act. In fact, he adds, the U.S.’s newest weather satellite, GOES-17, is experiencing problems with one of its instruments, preventing scientists from using the observational data. Scientists at CIMSS are working with NOAA scientists to find a solution to the problem. With more than 50 CIMSS-developed algorithms in use by the National Weather Service (NWS), CIMSS has a demonstrated track record of transitioning forecasting tools that incorporate improved observations from the research environment to the NWS operational environment. Currently, CIMSS researchers are developing and testing a new forecasting model in support of the Next Generation Global Prediction System, an NWS initiative to improve forecasts and address growing service demands, another piece of the Weather Act. There aren’t many universities running this model, says Ackerman, a professor of atmospheric and oceanic sciences. Doors for the event open at 2 p.m. It is free and open to the public.